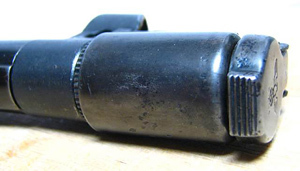 The main purpose of a muzzle cap is to prevent that dust and sand enter the barrel. The barrel has to be clean under all circumstances in order to fire without stoppages or worse. 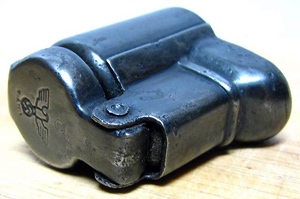 Muzzle caps are made for a wide variety of rifles, MG's and SMG's. 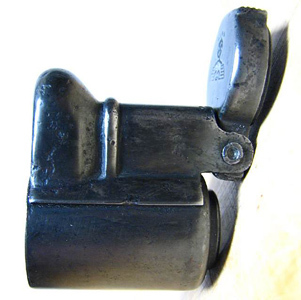 The first one was the metal muzzle protector produced for the MP38 in the first place. 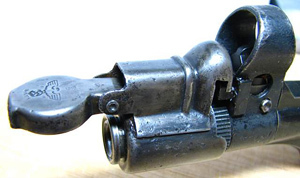 This design was based on the metal muzzle cap produced for the K98 rifle. The caps are not interchangable. 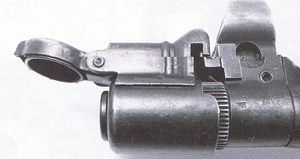 The MP38 had a L shaped connector attached to the front sight. 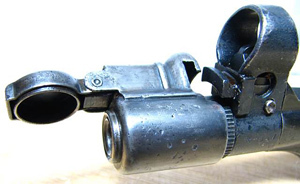 To this connector you can hook up the metal muzzle cap. 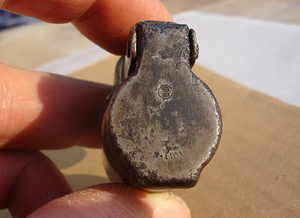 The muzzle nut was then covered by the metal cap. 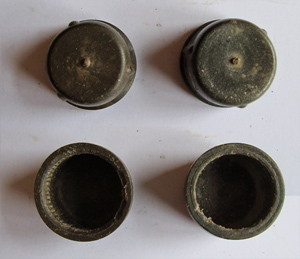 The metal cap itself had a metal lit which could be opened or closed. The only reason why the cap was opened was to clean the weapon. 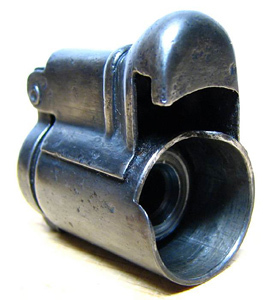 The inside diameter of the Muzzle protector was slightly smaller then the 9mm, actually ist was about 7,8 mm. The smaller opening was used as a kind of guidance for the cleaning chain. 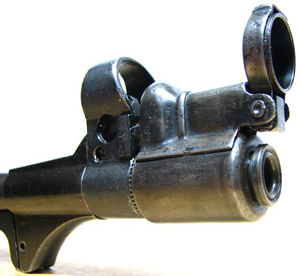 In this way the the muzzle of the weapon could not be damaged. The muzzle protector was never meant to shoot through. 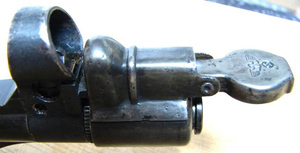 When sharp rounds needed to be shot the complete muzzle protector needed to be removed. If this was not done it could lead to severe accidents. 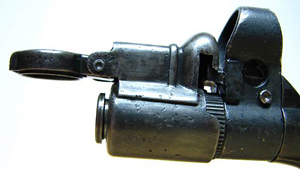 lso the early MP40's had the same L shaped connectors attached to the front sight. 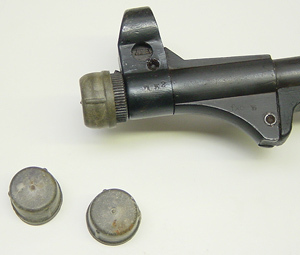 Judging by the serial number I have, sofar discovered, it seems that Steyr already stopped producing the L shaped connector on the MP40 in 1940. Sofar I have not seen any BNZ coded MP40's with this feature. Only 660 coded MP40's havethem. Haenel and Erma seemed to have produced MP38's and MP40's with this feature way into 1941. 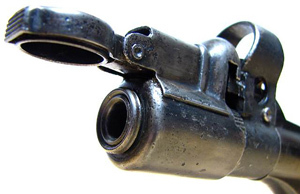 The metal muzzle cap was an overly complex and expensive attribute. Apart from this they did not always function very well. Apart from the accidents just mentioned it also tempted to freeze during winter conditions so that the soldier could not open it when necessary. This page was corrected on Februari 14th 2009 thanks to new information I received from "Fridas". 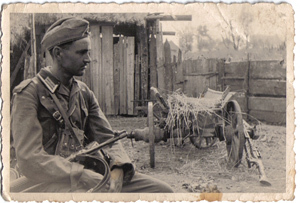 A K98 collector from Germany. Please let me know if have any additional information at info@mp40.nl. 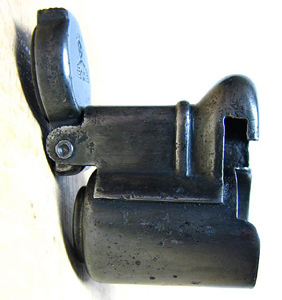 The hinged metal muzzle cap is an extremely rare item these days. The last one I saw was sold for about 800 USD on Ebay. 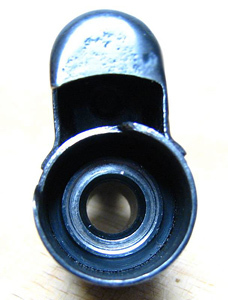 The second version is the rubber muzzle cap. 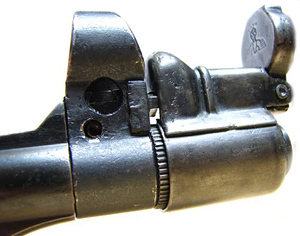 The MP40 muzzle cap was similar to the K98 one. Only slightly bigger in order to fit the 9mm muzzle nut. This one had the advantage that in case of emergency you could shoot through the rubber cap. 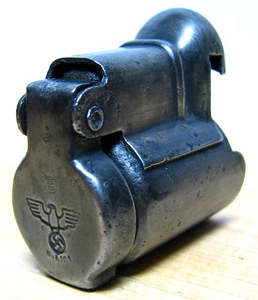 Every soldier equiped with an MP40 received four of these. 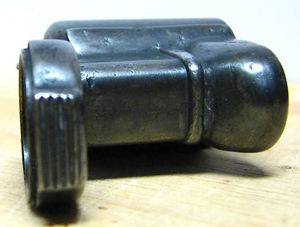 With the introduction of the rubber cap the factories changed over to a different muzzle nut as well. 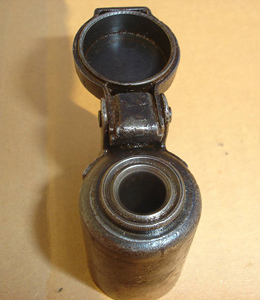 The early muzzle nut did not have the machined groove yet since it was not necessary for the "old" hinged metal muzzle cap. 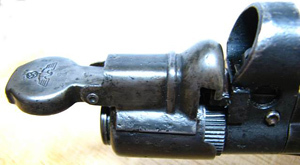 All the MP40's after 1941 had a new muzzle nut with groove. Original ones are quite rare since they were considered expandable. Sometimes they turn up in ground dugs. At the moment a lot of fakes are being sold as original ones. 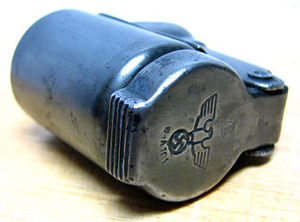 The rubber MP40 cap was also used on early MP44's. 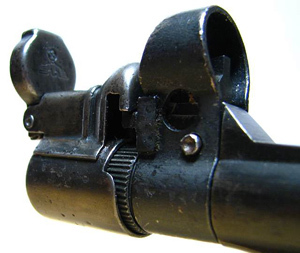 Late MP44 or Stg44 did not hae the muzzle nut on it. It used to be a flexible and elastic material. These days the rubber muzzle cap needs to be heated up before placement around the muzzle. 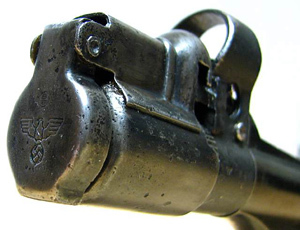 The third version was a result of shortages in supply of the rubber muzzle cap. 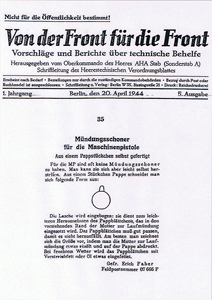 It was advised in an issue of "Von die front fur die front" to make one yourself from oil drained cartonboard. This had to be put up front of the muzzle. Below you find a copy of the notice that was made in the "Von der Front fur die Front"of the 20th of April 1944. 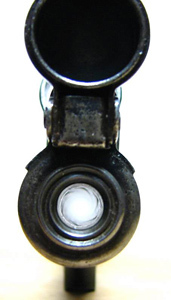 Below you find a whole series of very detailed pictures of a hinged metal muzzle cap that was offered on gunbroker.com. I did not get an answer on my question if I was allowed to place these pictures. If you own these pictures and you don't allow me to place them please send me an email and I will remove them again. 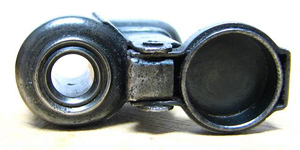 If you have any further information on the muzzle caps or high quality pictures then please let me know info@mp40.nl.